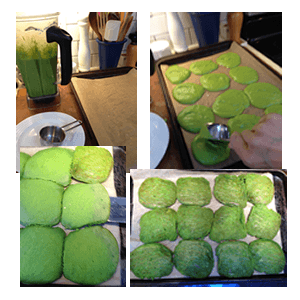 These plantain based pancakes with baby spinach are bright green, hence I gave them the name “Kermit Pancakes”. For me these pancakes were are big part of being able to stick to the AIP (Autoimmune Paleo) diet, especially at the beginning. Make a batch and enjoy them fresh, that’s when they are the best, but they also store well in an airtight container in the fridge for up to 4 days. The pancakes can also be frozen and reheated in the toaster oven. Set oven to 400 F convection (425 F if no convection). Arrange 2 racks to in the middle of the oven if using convection oven, otherwise 1 rack in the middle. 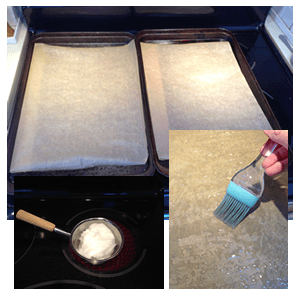 Place unbleached parchment paper or silicone baking mats on 2 oven trays. Rinse plantains and cut off ends, then slice in half and score each half lengthwise. 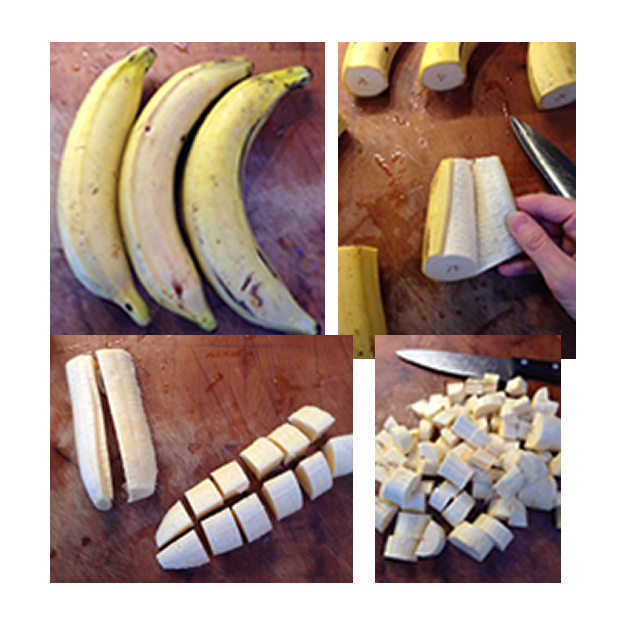 Using your hands, peel the plantains, slice lengthwise and dice. Place in high speed blender. Melt coconut oil in a small sauce pan on the stove. Use 3 tbsp for recipe, use 2 tbsp (1 tbsp for each tray) to brush on top of parchment paper or silicone mats. Brushing with oil will give the pancakes a nice golden surface. Add the following ingredients to the blender: water, arrow root, coconut flour, baking soda, sea salt, melted coconut oil and apple cider vinegar. Finally add 3 handfuls of baby spinach. 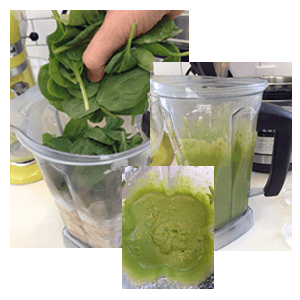 Blend in high speed blender, gradually bringing it to full speed. If using a Vitamix, use the tamper to get all ingredients incorporated. Blend until smooth, do not over blend. Use a 1/4 cup measurement to scoop pancakes on to prepared baking trays. You may fill 2 trays, or be a few pancakes short, how much batter you get depends on the size of your plantains. Bake in the middle of the oven for approx. 6 minutes until pancakes are holding together so they can be flipped and are slightly golden. Bake for another 3-4 minutes. Times may vary depending on your oven, check oven often when first making this recipe. 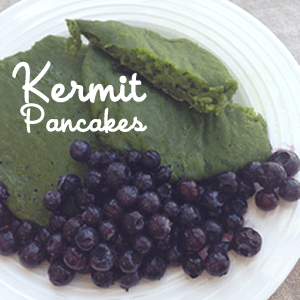 Kermit pancakes are best right out of the oven! I like these pancakes with blueberries, I thaw frozen wild blueberries and they are a juicy accompaniment. TIP! Choosing plantains - how ripe your plaintains are will make a difference in how liquid your batter will be. Look for plantains that are more green/yellow for a thicker batter, but that is not always available. If your plantains are on the riper side you may need another tbsp. of coconut flour to thicken the batter. See Annika Recommends for resources. For more recipes and other free resources on how to live an anti-inflammatory lifestyle visit TrulyU.com.